150 000 Jews in Hitler’s Army – This bit of history was hidden from us …..
“Not every victim was a Jew but every Jew was a victim.” -Elie Wiesel speaking of World War II. “If there were Jews in (Hitler’s) armed forces…who served knowing what was going on and made no attempt to save (lives), well then that is unacceptable and dishonorable.” -Rabbi Marvin Hier, director of the Simon Wiesenthal Institute. Thousands of men of Jewish descent and hundreds of what the Nazis called ‘full Jews’ served in the German military with Adolf Hitler’s knowledge and approval. In approximately 20 cases, Jewish soldiers in the Nazi army were awarded Germany’s highest military honor, the Knight’s Cross. One of these Jewish veterans is today an 82 year old resident of northern Germany, an observant Jew who served as a captain and practiced his religion within the Wehrmacht throughout the war. One of the Jewish field marshals was Erhard Milch, deputy to Luftwaffe Chief Hermann Goering. Rumors of Milch’s Jewish identity circulated widely in Germany in the 1930s. DID THE JEWS IN HITLER’S ARMY CAUSE THE ‘HOLOCAUST’? Rigg’s research also shed light on stories surrounding the rescue by German soldiers of the Lubavitcher grand rabbi of that time, who was in Warsaw when the war broke out in 1939. Joseph Isaac Schneerson was spirited to safety after an appeal to Germany from the United States. Schneerson was assisted by a German officer Rigg has identified as the highly decorated Maj. Ernst Bloch, whose father was a Jew. Jews also served in the Nazi police and security forces as ghetto police (Ordnungdienst) and concentration camp guards (kapos). So what happens to the claim that Hitler sought to exterminate all Jews, when he allowed some of them to join in his struggle against Bolshevism and International finance capitalism? William D. Montalbano, “The Jews in Hitler’s Military,” Los Angeles Times, Dec. 24, 1996. Tom Tugend, “Grad student uncovers Jews who fought for Adolf Hitler,” Jewish Telegraph Agency, Dec. 26, 1996. Lenni Brenner, Zionism in the Age of the Dictators. “Half-Jew” and field-marshal Erhard Milch (left) with General Wolfram von Richthofen. Hitler declared Milch Aryan. He was awarded the Ritterkreuz for his performance during the campaign in Norway in 1940. 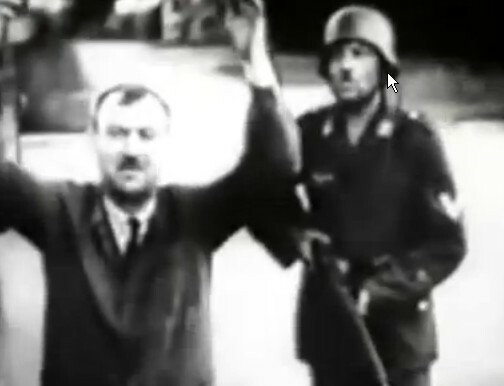 General Gotthard Heinrici, who was married to a “half-Jew,” meeting Hitler in 1937. Contrary to conventional views, Rigg reveals that a startlingly large number of German military men were classified by the Nazis as Jews or “partial-Jews” (Mischlinge), in the wake of racial laws first enacted in the mid-1930s. Rigg demonstrates that the actual number was much higher than previously thought–perhaps as many as 150,000 men, including decorated veterans and high-ranking officers, even generals and admirals. As Rigg fully documents for the first time, a great many of these men did not even consider themselves Jewish and had embraced the military as a way of life and as devoted patriots eager to serve a revived German nation. In turn, they had been embraced by the Wehrmacht, which prior to Hitler had given little thought to the “race” of these men but which was now forced to look deeply into the ancestry of its soldiers. The process of investigation and removal, however, was marred by a highly inconsistent application of Nazi law. Numerous “exemptions” were made in order to allow a soldier to stay within the ranks or to spare a soldier’s parent, spouse, or other relative from incarceration or far worse. (Hitler’s own signature can be found on many of these “exemption” orders.) But as the war dragged on, Nazi politics came to trump military logic, even in the face of the Wehrmacht’s growing manpower needs, closing legal loopholes and making it virtually impossible for these soldiers to escape the fate of millions of other victims of the Third Reich. Based on a deep and wide-ranging research in archival and secondary sources, as well as extensive interviews with more than four hundred Mischlinge and their relatives, Rigg’s study breaks truly new ground in a crowded field and shows from yet another angle the extremely flawed, dishonest, demeaning, and tragic essence of Hitler’s rule. Side and front photographs of “half-Jew” Anton Mayer, similar to those that often accompanied a Mischling’s application for exemption. “Half-Jew” and field-marshal Erhard Milch, left, stands with Gen. Wolfam von Richthofen. Hitler declared Milch an Aryan. (Reuters) — As many as 150,000 men of Jewish descent served in the German military under Adolf Hitler, some with the Nazi leader’s explicit consent, according to a U.S. historian who has interviewed hundreds of former soldiers. Bryan Mark Rigg, history professor at the American Military University in Virginia, told Reuters on Thursday that the issue of soldiers of partial Jewish descent was long a somewhat taboo subject, overlooked by most academics as it threw up thorny questions. According to the Nuremberg Laws of 1935, Jews or those of partial Jewish descent were unfit for military service, but Rigg tracked down and interviewed more than 400 former soldiers of partial Jewish descent — labelled “Mischlinge” (“half-caste”) by the Nazis. He estimates there were about 60,000 soldiers with one Jewish parent and 90,000 with a Jewish grandparent in the Wehrmacht, the regular army as distinct from the Nazi SS. “They thought ‘if I serve well they’re not going to hurt me and not going to hurt my family’,” he said. However, on returning home from the campaign in Poland at the start of the war to find persecution of their families worsening, many soldiers classified as half-Jewish started to complain, prompting Hitler to order their dismissal in 1940. But many of these so-called half-Jewish soldiers continued to serve, sometimes due to delays in the discharge order reaching the front, because they concealed their background or because they applied and won clemency for good service. Many senior officers with Jewish ancestry won special permission to serve from Hitler himself. “History is not so black and white. History about Mischlinge shows how bankrupt the Nazi racial laws were,” said Rigg. While Germany has long been aware of men serving as soldiers who Nazi race laws should have classified as Jewish, most notably former Chancellor Helmut Schmidt and Luftwaffe Field Marshal Erhard Milch, Rigg’s large estimate has surprised many. Die Welt daily called Rigg’s book “Hitler’s Jewish Soldiers” “one of the most important Holocaust studies of recent years”. The author was in Berlin to launch the German language version. Rigg, who has served in the U.S. Marines and as a volunteer in the Israeli army, was moved to research the subject after he discovered his own Jewish ancestry while probing his family tree and after a chance meeting with a Jewish Wehrmacht veteran. Many of his subjects were telling their story for the first time and in some cases their families knew nothing of their Jewish heritage. “They would talk their hearts out, telling me all about this schizophrenic story they went through,” he said. He is convinced that most of the soldiers of Jewish decent were not aware of the Nazis’ systematic murder of Jews, noting that most half-Jews reported to deportation stations in 1944. “Most say they do not feel guilty about serving in the military, they feel guilty about what they didn’t do to save their relatives,” he said. On the murderous road to “racial purity” Hitler encountered unexpected detours, largely due to his own crazed views and inconsistent policies regarding Jewish identity. After centuries of Jewish assimilation and intermarriage in German society, he discovered that eliminating Jews from the rest of the population was more difficult than he’d anticipated. As Bryan Mark Rigg shows in this provocative new study, nowhere was that heinous process more fraught with contradiction and confusion than in the German military. Contrary to conventional views, Rigg reveals that a startlingly large number of German military men were classified by the Nazis as Jews or “partial-Jews” (Mischlinge), in the wake of racial laws first enacted in the mid-1930s. Rigg demonstrates that the actual number was much higher than previously thought–perhaps as many as 150,000 men, including decorated veterans and high-ranking officers, even generals and admirals. As Rigg fully documents for the first time, a great many of these men did not even consider themselves Jewish and had embraced the military as a way of life and as devoted patriots eager to serve a revived German nation. In turn, they had been embraced by the Wehrmacht, which prior to Hitler had given little thought to the “race” of these men but which was now forced to look deeply into the ancestry of its soldiers. The process of investigation and removal, however, was marred by a highly inconsistent application of Nazi law. Numerous “exemptions” were made in order to allow a soldier to stay within the ranks or to spare a soldier’s parent, spouse, or other relative from incarceration or far worse. (Hitler’s own signature can be found on many of these “exemption” orders.) But as the war dragged on, Nazi politics came to trump military logic, even in the face of the Wehrmacht’s growing manpower needs, closing legal loopholes and making it virtually impossible for these soldiers to escape the fate of millions of other victims of the Third Reich. Based on a deep and wide-ranging research in archival and secondary sources, as well as extensive interviews with more than four hundred Mischlinge and their relatives, Rigg’s study breaks truly new ground in a crowded field and shows from yet another angle the extremely flawed, dishonest, demeaning, and tragic essence of Hitler’s rule. Side and front photographs of “half-Jew” Anton Mayer, similar to those that often accompanied a Mischling’s application for exemption. To see more photographs from the book, click here “Through videotaped interviews, painstaking attention to personnel files, and banal documents not normally consulted by historians, and spurred by a keen sense of personal mission, Rigg has turned up an unexplored and confounding chapter in the history of the Holocaust. The extent of his findings has surprised scholars.”–Warren Hoge, New York Times “The revelation that Germans of Jewish blood, knowing the Nazi regime for what it was, served Hitler as uniformed members of his armed forces must come as a profound shock. It will surprise even professional historians of the Nazi years.” –John Keegan, author of The Face of Battle and The Second World War “Startling and unexpected, Rigg’s study conclusively demonstrates the degree of flexibility in German policy toward the Mischlinge, the extent of Hitler’s involvement, and, most importantly, that not all who served in the armed forces were anti-Semitic, even as their service aided the killing process.”–Michael Berenbaum, author of The World Must Know: The History of the Holocaust “Rigg’s extensive knowledge and the preliminary conclusions drawn from his research impressed me greatly. I firmly believe that his in-depth treatment of the subject of German soldiers of Jewish descent in the Wehrmacht will lead to new perspectives on this portion of 20th century German military history.”–Helmut Schmidt, Former Chancellor of Germany “An impressively researched work with important implications for hotly debated questions. Rigg tells some exquisitely poignant stories of individual human experiences that complicate our picture of state and society in the Third Reich.”–Nathan A. Stoltzfus, Florida State University, author of Resistance of the Heart: Intermarriage and the Rosenstrasse Protest in Nazi Germany “An impressive work filled with interesting stories. . . .
By helping us better understand Nazi racial policy at the margins–i.e., its impact on certain members of the German military–Rigg’s study clarifies the central problems of Nazi Jewish policies overall.”–Norman Naimark, Stanford University, author of Fires of Hatred: Ethnic Cleansing in Twentieth-Century Europe “An illuminating and provocative study that merits a wide readership and is sure to be much discussed.”–Dennis E. Showalter, Colorado College, author of Tannenberg: Clash of Empires “An outstanding job of research and analysis. Rigg’s book will add a great deal to our understanding of the German military, of the place of Jews and people of Jewish descent in the Nazi state, and of the Holocaust. It forces us to deal with the full, complex range of possible actions and reactions by individuals caught up in the Nazi system.”–Geoffrey P. Megargee, author of Inside Hitler’s High Command “With the skill of a master detective, Bryan Rigg reveals the surprising and largely unknown story of Germans of Jewish origins in the Nazi military. His work contributes to our understanding of the complexity of faith and identity in the Third Reich.”–Paula E. Hyman, Yale University, author of Gender and Assimilation in Modern Jewish History and The Jews of Modern France “A major piece of scholarship which traces the peculiar twists and turns of Nazi racial policy toward men in the Wehrmacht, often in the highest ranks, who had partly Jewish backgrounds. Rigg has uncovered personal stories and private archives which literally nobody knew existed. His book will be an important contribution to German history.”–Jonathan Steinberg, University of Pennsylvania, author of All or Nothing: The Axis and the Holocaust 1941-1943 “An original, groundbreaking, and significant contribution to the history of the Wehrmacht and Nazi Germany.”–James S. Corum, School of Advanced Air Power Studies, author of The Roots of Blitzkrieg and The Luftwaffe “Rigg’s work has discovered new academic territory.”–Manfred Messerschmidt, Freiburg University, author of Die Wehrmacht im NS-Staat (The Wehrmacht in the Nazi State) BRYAN MARK RIGG received his B.A. with honors in history from Yale University in 1996. Yale awarded him the Henry Fellowship for graduate study at Cambridge University, where he received his M.A. in 1997 and Ph.D. in 2002. Currently Professor of History at American Military University, he has served as a volunteer in the Israeli Army and as an officer in the U.S. Marine Corps. His research for this book has been featured in the New York Times, Los Angeles Times, and London Daily Telegraph. The thousands of pages of documents and oral testimonies (8mm and VHS video) the author collected for this study have been purchased by the National Military Archive of Germany. The Bryan Mark Rigg Collection is housed in the Bundesarchiv-Militrarchiv in Freiburg, Germany. Click here to learn more about the author and his research experiences. Jewish capo leading to death another Jew in Warsaw ghetto. 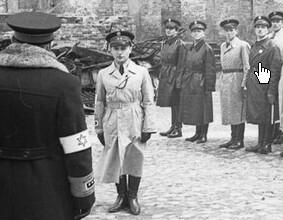 Hitler’s Jewish Police – the most feared. All I want to say to the pamphlet by a jew called Bryan Mark Rigg is this. Jews whether practicing their so called religion which is a fraud because judaism is a talmudic rassist political predator ideology which believes that they are superior to nonjews and all land of the earth is theirs and gentiles only live to serve the jews. So what does it mean if a group of jews assimilate in a country of the world meaning jewish emancipating in a country? It means first of all they have zero(!) loyalty to the native inhabitants and they arel constantly working to overtake and enslave the country. They are parasites and all major problems that happen today show exactly this. They are traitors by definition as john Kaminski said in his short video series called the destabilization template. Jews have been accepted by the good Christian Germans since the middle of the 19th century. But the greedy jews never have enough until the whole country was bleeding and economy down to zero and after that the jews illegitimately usurping all assets owned by the people of the foreign country until they have everything in their hand. That’s what the communist jews are. Criminal parasite usurpers and they do not care whether the people are suffering, starving or dying. On the contrary they seek and still do to kill as much Germans they can to finish up the transformation process of all hard-earned properties of the ethnic Germans. Watch up true Christian America what happen to Christian Germany is coming to you and your neighborhood also as long as you server the counterfeit jews and counterfeit israhell. The Revolution will be won in a day. The true Revolution, no those payed and funded by the usurping criminal jews. But first you have to take back the media, revising history and the unique selling point (money creation) usurped by the jews. Amazing and startling and confusing. Why do we learn this now, 75 years AFTER the war? This entry was posted on September 1, 2014 by HKW in Jews, Nazis, World War 2 and tagged History, Hitler's jewish Police, Hitler's secret army, Nazis collaborators, WW2, Zionism.